Though I wish I could take credit, all of the credit for this recipe goes to Matthew. Up until this recipe, our entire relationship was founded on my dislike of raw fish (except in sushi). However, Matt made a raw fish lover out of me... so long as it is properly marinated of course. 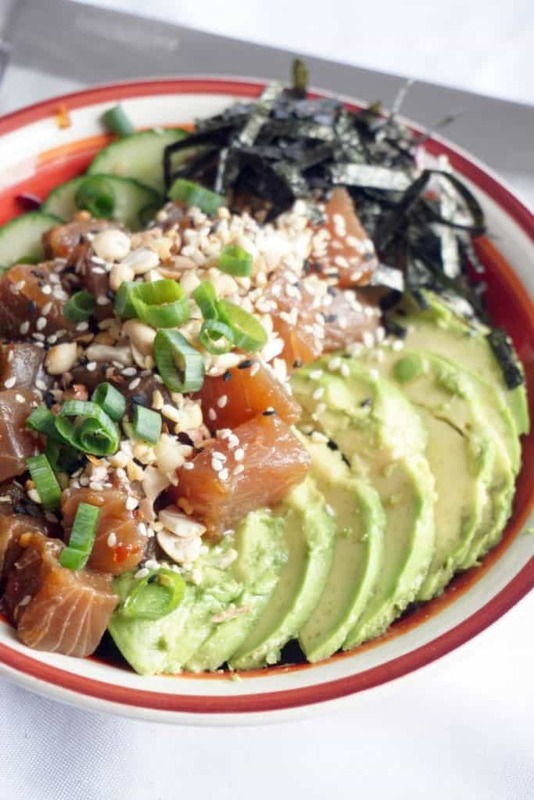 And, I guarantee this Ahi Poke Bowl will make a raw fish lover out of you too! The most important aspect of this recipe is the tuna itself. You don't just want to go to a random grocery store and buy the "fresh" fish from the seafood counter. The truth is that most "fresh" fish have been frozen and thawed, which means it could have been sitting out for hours or days. Since you will be eating this raw you want to spring for the good stuff. It doesn't have to be expensive by any means, but we, at the very least recommend getting it frozen, and if possible, wild caught. Aside from picking your fish the marinade and rest of the bowl is very simple. The marinade will mostly be soy sauce which is always a great addition to any recipe! This tuna poke bowl is the first of two poke bowls we are releasing. Hint: the second is salmon. What we love about tuna is how hearty it is. They don't call it a tuna 'steaks' for nothing! However, something to note is that due to how thick and steak like it is it's not as penetrable as other fish, so you might wan to marinate 2+ hours. This will ensure the full flavor of the marinade comes through, and for those of you, such as myself, who don't love the taste of raw fish, you won't have any issues. Bowl recipes are one of our favorites to make because you can honestly put anything you want in them. For this bowl we used cabbage as the base, but you can swap it out for cauliflower rice to go a more traditional route. Some other recipes we make 'bowl style' are our Mexican Breakfast Bowl and Low Carb Breakfast Bowl which are must trys in our opinion! Remember, to have an open mind when it comes to all foods so whether or not you enjoy raw fish, know that you will enjoy this Ahi Poke Bowl! 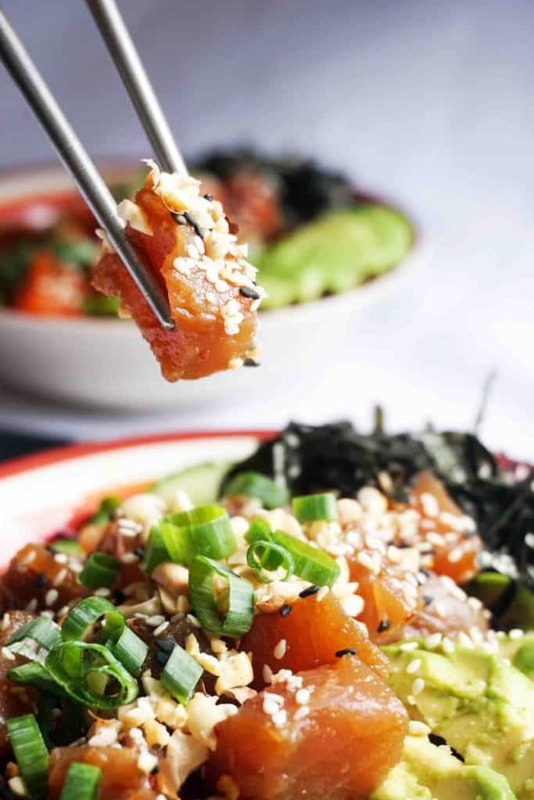 Recipe can be quickly added to MyFitnessPal - Search "KetoConnect - Ahi Poke Bowl"
Cut tune steak into bite sized pieces and set aside. 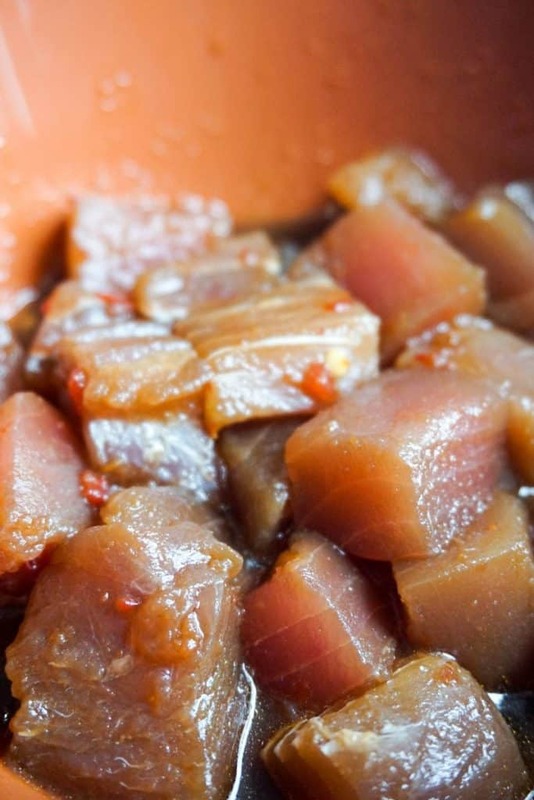 Add marinade to a bowl and toss in the tuna. Place plastic wrap over the bowl pressing it against the tuna and place in fridge of 2+ hours. Slice up cucumber and avocado and set aside. Add cabbage to a bowl drizzle with sesame oil and rice wine vinegar and toss. Place cucumber and avocado on top. Once tuna has been marinating for at least 2 hours remove from bowl leaving excess marinade in bowl and place on top of cabbage. Top with sesame seeds, sushi nori and scallions. Serve cold and enjoy!